Home » Greenroom » Do You Make These Entrance Mistakes? Do You Make These Entrance Mistakes? Facilities and establishments are busy places. People come and go at all times and they pass through the entrance, making it one of the busiest spots in a building. Unfortunately, many businesses and offices do not pay too much attention to their entrances and so they make mistakes in connection with it. The entrance of an establishment is very important. It’s the first thing that people would see when they go to a store or a business. It has to be right in order to leave the perfect impression. For employees, it is the first thing that they would see of their workplace. The entrance of a building can look and feel inspiring or it can give a gloomy feel to people passing through, that can affect how employees feel throughout the entire workday. Another reason why the entrance is an important area in a facility is because it can be utilized in keeping a building clean. 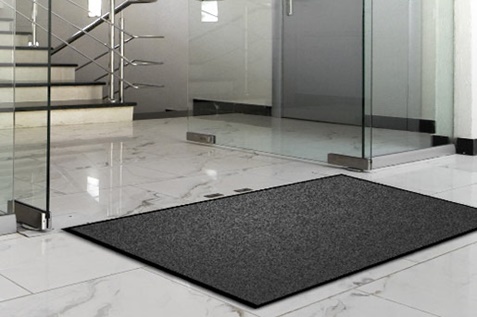 Using a proper floor mat in the entrance can dramatically reduce the amount of dirt and dust coming into a facility, which in turn reduces cleaning costs. For a wide range of floor mat options, enquire at Alsco. Are you looking for ways that you can improve the cleanliness in your building? The first place to start is the most obvious one, the entrance. That’s where most of the “action” should take place. Action, meaning in this context to be cleaning. A common entrance mistake made by many establishments is not keeping the immediate outside area clean enough. The pavement outside a building, the parking area, and other exterior areas are the places where people can pick up dirt and dust, which can end up inside, which in turn can drive up the cost of cleaning your place. More than 90% of the dirt that ends up in indoor carpets comes from shoes and people pick those up from the exterior of a building. So it is absolutely crucial to keep the exteriors clean at all times. While keeping the exterior of an establishment clean is a must for any business, it would not take away all of the dirt and grime that is out there. Some dirt and dust can still be carried by the traffic, it’s impossible to keep the interior sterile after all. The next step then is to have entrance mats that would protect your floor and control the dust and dirt due to high foot traffic. A good entrance mat should be at least 20 feet long, so it can capture dust from the soles of the people walking over it. The mat should have been specifically designed to trap moisture and dirt so it goes no further than the entrance. No matter how many precaution you take to prevent dust from entering your establishment, some can still get through. This is why there is a need for regular cleaning. The entrance of an establishment, especially the entrance mat, has to be vacuumed on a daily basis. Unfortunately, this requirement is often forgotten and many establishments fail to vacuum, not just their entrances but their whole interior daily. This leads to the build-up of dirt and dust which makes it more difficult to clean. You have to see to it that your entrance gets a daily dose of vacuuming. Focus on those areas that get a great deal of traffic. Even if you perform daily vacuuming it is not going to be enough. Experts suggest that for entrance mats and rugs that pile lifting vacuums should be used because regular vacuum cleaners are not adequate. In order to remove the dry dirt that clings on to the fabric of a mat or a rug, a pile lifting vacuum would be the best to use. In pile lifting the yarns are opened up, lifted, and raised vertically which makes it easier for the dirt to be removed. For an establishment that deals with heavy traffic, not using pile lifting vacuum would be a mistake. While the specialized vacuum cleaner that can perform pile lifting can cost more, it is far more cost-effective in the long run. One reason why some businesses fail to clean vacuum the entrances as often as they should is because they try to clean everything. They aim to clean the all of the floor areas of their building, which takes a great deal of effort. In a building with multiple floors, this would take a great deal of time and effort. It is better to focus on the areas that get more traffic. The places that do not get as much traffic would not require the same amount of cleaning as the entrance. While wall to wall cleaning should be performed occasionally, it is better to concentrate on the entrance for the daily vacuuming. Halls, where people pass through are areas that get a deal of traffic, but the place where most effort should be concentrated should be the entrance. There is a tendency to over-extend the use of an entrance mat. That means a mat is still used even after it’s no longer functioning properly because of age. An entrance mat can get worn out quickly and may not even last as long as its manufacturers suggest if it gets too much traffic. Over-extending the life of an entrance mat can cost more in the long run than if the mat were to be replaced right away. The equipment used for cleaning should be maintained and cleaned properly at all times. Equipment, like a vacuum, that’s poorly maintained, is not going to be very efficient in cleaning. It means it would take more time and cost more to clean an area. Improperly maintained equipment would also have to be replaced sooner than well-maintained ones. Though the lifts are technically no longer part of the entrance, cleaning them should belong to the same category. Not cleaning the lift floors can mean spreading dirt and dust to the upper floors. This is why they should be cleaned at least once every week. It would also be a great idea to have the lift floors carpeted so that it can capture dust from the traffic using it. Dry cleaning the carpet there would mean that it would have a quick turnaround. These are some of the more common entrance mistakes that are committed by establishments. You should be able to tell by now if you have been making one or two of these wrong moves in your own building. Get Alsco’s managed floor mat rental system for a safer and cleaner workplace without the hassle. Enquire now!